Estimated U.S. natural gas demand on January 1, 2018 reached 150.7 billion cubic feet, surpassing the previous single-day record set in 2014, according to estimates from PointLogic. Much colder-than-normal temperatures across much of the United States have led to increased demand for heating, much of which is provided by natural gas. 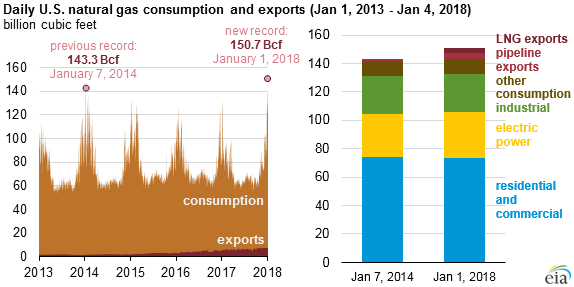 Although residential and commercial natural gas consumption did not appear to surpass previous records, higher consumption in the electric power and industrial sectors, greater exports of natural gas to Mexico, and more demand for liquefied natural gas (LNG) feedstock gas contributed to the recent record demand level. Note: Other consumption includes lease and plant fuel consumption, pipeline and distribution use, and vehicle fuel. Natural gas consumption is typically highest in the winter months, when residential and commercial demand for heating fuels increases. Industrial sector consumption of natural gas is relatively less seasonal but is also higher in winter months. Although the electric power sector consumes the most natural gas during summer months, when overall electricity demand is highest, power sector consumption of natural gas can also increase in winter months. Many homes and commercial buildings use electricity either as their primary or secondary heating fuel, and overall increases in electricity demand are often met by natural gas-fired generators. This past week, increases in demand led to higher prices in natural gas and electricity markets. Day-ahead natural gas prices for delivery for January 1, 2018, neared $30 per million British thermal units at trading locations in the Mid-Atlantic region, New York, and Boston, according to Natural Gas Intelligence. Because the spot price of natural gas affects power prices in many parts of the United States, spot wholesale electricity prices also rose, surpassing $200 per megawatthour (MWh) in New York City and $185/MWh in New England, according to data from SNL Energy. Record demand levels are likely to lead to high withdrawals of natural gas from storage fields. EIA’s Weekly Natural Gas Storage Report (WNGSR) showed that in the Lower 48 states, natural gas storage levels as of Friday, December 29, were 3,126 billion cubic feet (Bcf), or about 6% lower than both the previous five-year average (2012–2016) and year-ago levels. In the East region, which covers the Atlantic Coast and some Midwestern states, inventory levels were 740 Bcf, equal to previous year levels and about 5% lower than the previous five-year average. Inventory changes for the week ending January 5 will be released Thursday, January 11. Generally, changes in natural gas storage are correlated with changes in temperature. Heating degree days represent temperature deviations below 65 degrees Fahrenheit and are weighted based on population distributions across the country. During the previous record withdrawal for the week ending January 9, 2014, U.S. population-weighted heating degree days reached 255. In that week, 288 billion cubic feet of natural gas were withdrawn from storage. For the week ending January 5, 2018, heating degree days are forecast to reach 281. In addition to the winter heating fuels data and analysis that EIA publishes seasonally, EIA’s weather-related energy market information includes an updated presentation on winter weather indicators and a Northeast market snapshot, which provides daily information regarding Northeast natural gas and electricity markets.